We have spent the past couple of weeks getting ready to reopen after our winter break. 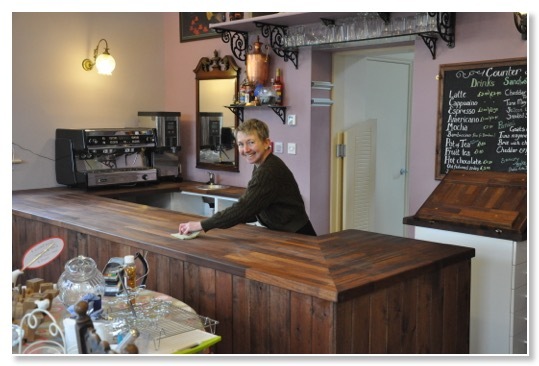 There’s been plenty to do, including giving the coffee shop a thorough clean from top to bottom. The ‘top’ part was done with the assistance of a tall step ladder and industrial vacuum cleaner loaned by a friend of ours. Getting the dust from the tops of beams and changing lightbulbs was easy as a result. Emily gave our counter a much needed coat of Danish oil - moisturiser for wood. Everything has been checked and cleaned and orders placed for supplies we’ll need once we open on Saturday. It’s schools’ half term up here next week and the steam trains will be running after their winter break. We’ve had several bouts of snow, some in January that was pretty severe, some like yesterday, which barely stayed a night and a day. We were in Scarborough when yesterday’s snow started and abandoned our plans for a Wednesday pizza and movie as it looked quite grim at 4.30pm. Our journey home (20 miles across the moor road) normally takes 40 minutes. Last night it took two and a half hours crawling along with snow blowing horizontally across the road in the strong winds. Our Landrover coped well, some other people weren’t so lucky. We were glad we’d managed to get the Landrover’s heater fixed the week before though. A combination of inclement weather and minor illness meant we achieved less in the weeks since Christmas than we’d hoped. The deck we had planned to build out front in the playground area to raise up the tables, so people get a good view of the trains, remains on the drawing board. We’ll manage it later in the year. We did manage to get down to the South-West and to London to see old friends and family though. A highlight was seeing our son’s band ‘Gecko’ in London at the 12 Bar club on Denmark Street. They were brilliant. We are a bit apprehensive about reopening after this break. Will we still remember how to do everything? Will anybody come? Will they like it when they get there? We’re sure it will be fine, but it will be good to get the first week under our belt. We’re really pleased to have our three local young people rejoining the team at weekends. They did really well for us last year and are looking forward to doing the training on the coffee machine we have arranged for them. It’s good to have enthusiastic people we can rely on.